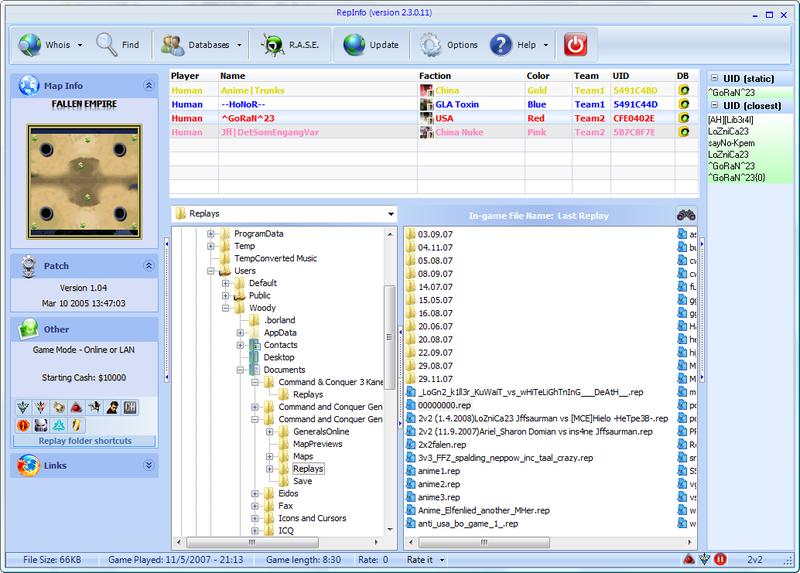 RepInfo is a replay manager, designed for the C&C Generals (CCG), C&C Generals Zero Hour (ZH), LOTR: The Battle For Middle Earth 2 (BFME2), LOTR: The Battle For Middle Earth (BFME), Lord Of The Rings - Rise of the Witch-King (RotWK), Company of Heroes (CoH), Dawn of War: Dark Crusade (DoW), Supreme Commander (SupCom) and Rise Of Nations - Rise Of Legends (RoL) games. This program shows you a lot of information about the players in the game, like what army they were and what colour they had etc. That isn't the most important thing of this program. RepInfo shows you all known cheaters! It gives you a warning sound when it detects a cheater in a replay. This system is based on the UID of the other players. On this way we can be 100% certain that it is the same person. Sometimes it can be a brother or sister, but you can't prove that, so we count it down as 1 person. The program has a special made "whois" button, with that button you can check where a player comes from. The person itself is being tracked down with his IP address. The database puts in automatically the players that you just have fought. On that way your database will get bigger, so you can see more different people and more different names of them. There is a maphack list in the database. This list will be updated when a new mh'er is found. The special list is for you to make. There you can add people that you don't like or a person that uses cheats like the scudbug in ZH. Now we come to the last part of RepInfo. It's called R.A.S.E., this friendly user interface part of RepInfo saves replays automatically when it is turned on! That can be very handy when you forgot to save a replay. With R.A.S.E. you never have to save replays by yourself again. You can also enable the feature “Save by Request”. It asks you to save a replay and gives you 30 sec . During that time he can save replay, using predefined Global Hotkey directly from the game without switch to back the RepInfo window. UID is a Unique player ID. It represents player internet IP but in hex format. There are two kinds of UID: Static and Dynamic. UID Type depends on user internet connection type. Static UID is more rare, but they allows with 100% accuracy determine players aliases. If you want to download the latest version of this software, please click here .